Kirkby Lonsdale is a small Historic Market Town on the edge of the Lake District and Yorkshire Dales in Cumbria. Sara Young reports on why it is so special and worth discovering. Every year, usually in the summer holidays, my sisters and me, with our parents would make the pilgrimage from where we live along the Sussex Coast to Kirkby, because it is also an important part of our history – it is where my Mum and Dad met. 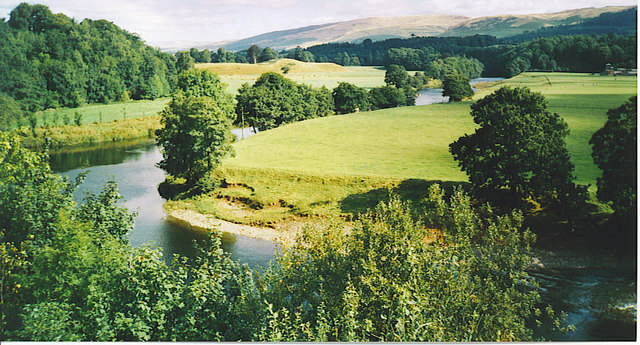 As well as the stunning countryside, in particular ‘Ruskin’s View’ which inspired a painting of the River Lune by Turner, our favourite spot was 12th or 13th century ‘Devil’s Bridge,’ so called because there is an unexplained deep, tiny hoof print in the stone, which legend has it was made by the Devil to put his mark on the bridge after he built it. 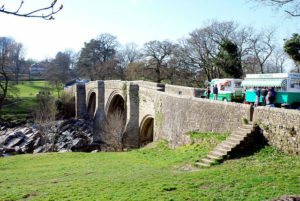 The Devil probably didn’t know that from 1955 onwards, Devils Bridge Snacks would sell bacon butties and cups of tea, which are both devilishly delicious but also redeemed by using locally sourced ingredients. 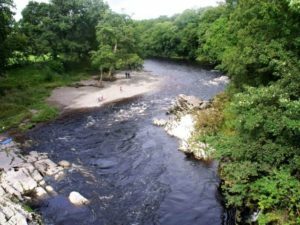 He also probably didn’t know that as children, we would wade through the River Lune, marveling at the clearness of the water and jumping across the rocks – splashing extra loudly to try and wake him up. We’d inevitably end up at The Mews Café for lunch, usually followed by homemade cake. Since 2011, The Mews has taken on a second identity transforming into the Italian Garden Restaurant at nighttime. This is the only example I can think of where an eating establishment is so chameleon-like, showing a real innovative way of using and sharing space. If we’d behaved, we’d be taken to The Sweet Shop – literally what is called, and allowed to choose a quarter of whatever looked best. My Dad used to buy sweets for my Mum from here every Friday after work and take them to her. Another of my parents’ frequently visited establishments was The Sun Inn, situated down the cobbled streets in the heart of the town. We didn’t go there as children, but I am assured it is always friendly, and they have fantastic beer. 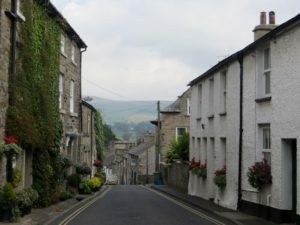 As well as my recommendations, you can now go on Summer Guided Walks of Kirkby Lonsdale with a Blue Badge Guide and every Thursday there is a Charter Market, which has changed location from the corner of Main Street and Market Street to the Georgian Square, but dates back to 1227. St. Mary’s rectory was used as the site of filming for the BBC adaptation of Daphne Du Maurier’s ‘Jamaica Inn’. The Church of St. Mary the Virgin dates back to Norman times. A particularly unusual and interesting feature is the green man with the foliage emerging from its mouth on one of the columns. 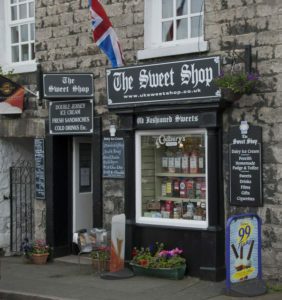 There is a quirky cluster of cafes and restaurants, and Kirkby Lonsdale is all about independent little shops and traditional produce. From the likes of Lune Valley Hampers, Lunesdale Bakery and Dales Traditional Butchers Ltd. – forget your supermarket chains, the closest you’ll get is the Spar. This all serves to remind that it is not only possible to fall in love at Kirkby Lonsdale. 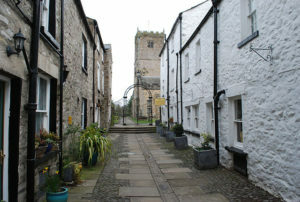 But also, to fall in love with Kirkby Lonsdale.